The playful elegance and the sweet, nuanced sound of this second violin by Franz Knitl both reflect the hallmarks of Jacobus Stainer's influence on European violin making during the 18th century and Mittenwald's violin-making tradition. 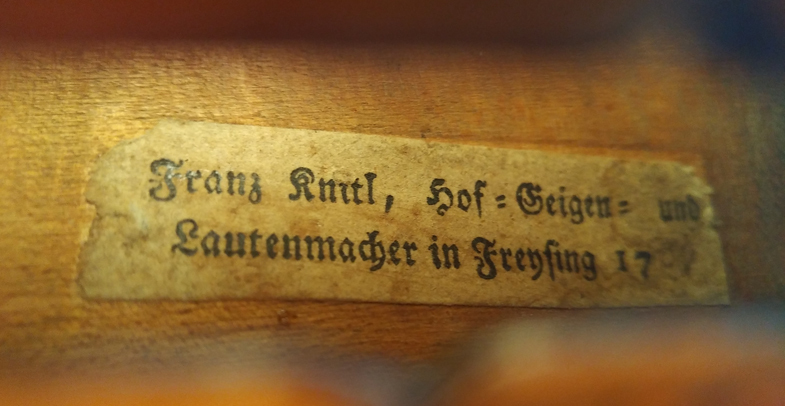 Like many fine Southern German master violins of the Mittenwald school, this instrument after Stainer is also full of unmistakable individuality: the rather small scroll was carved in an evocative and elegant style, and the delicate soundholes after Stainer and the lines of the arch indicate the experienced hand of a self-confident luthier. A highly transparent orange-golden-brown varnish coats the moderately-grained spruce used for the top, and the two-piece back of maple with mild floating flaming which was cast in its best light. This good violin that dates back to 1769 was thoroughly set up at our studio, and is with some few consistently well-executed repairs made to the top and rib preserved in good condition. The instrument is now ready to play, and it has a sophisticated sweet sound that is compelling in the richness of its timbre. Its adaptability allows musicians to play with great precision and nuance.